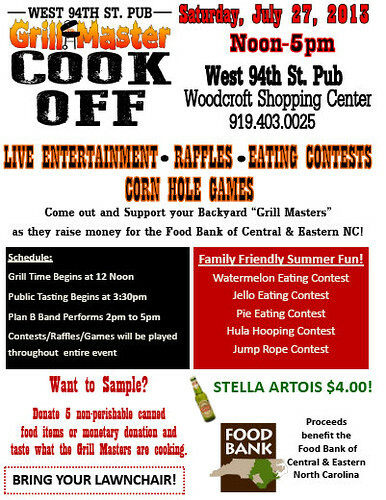 Grill Master Cook Off Competition at West 94th St. Pub in Durham This Saturday!! From time to time I am asked to help judge at foodie events and I am very excited to be a judge this weekend at the “Grill Master Cook Off” taking place at the West 94th Street Pub in Durham this Saturday July 27th from 12-5pm. This family friendly competition will host seven local Grill Masters who plan to show off their grillin’ skills with Chicken and Corn on the Cob. Grillmasters will be competing for bragging rights and a prize package of a 3 day, 2 night trip for two to Las Vegas! Proceeds from this fun event benefit the Food Bank of Central & Eastern North Carolina. Judging will begin at 3pm by four local “foodies”: John Huisman, aka Triangle Explorer, Kathy Hanrahan with WRAL “Out & About”, Matt Dees with Durham Magazine and Nancy Wykle with the Durham Herald Sun. Public tasting begins around 3:30pm. Public food tasting will be available to those who donate a minimum of 5 non-perishable canned food items or a monetary donation to the Food Bank of Central & Eastern NC. Family fun activities are planned throughout the entire time of the event which will include, Live Music by Plan B Durham Band, Raffle prizes, Corn Hole games, Family Eating Contests; such as a Watermelon Eating Contest, Jello Eating Contest, Pie Eating Contest, etc. Plan to bring your lawn chair, sample great food, enjoy family fun activities and see who will be crowned the Pub’s 1st Grill Master. Cook Off Competition winner will receive a 3 day, 2 night trip for two to Las Vegas. If you would like to compete or for more information, contact Kerry Bryant at kbpaw_21@msn.com. The Pub opened in August of 1994 as a family owned business. “Miss Sarah”, the owner had a vision of opening a “Cheers” like Pub in Southwest Durham. The Pub’s success comes from a unique combination of good food & relationships that have been formed over the last 19 years. The Pub has been a local hang out for our “Pub Regulars” for many years. They’re known for having the best Fish & Chips in Durham along with a staff who may not know your name, but know your face and drink of choice when you walk through our door. Over the last seven years the Pub has become a venue to help raise money for several non-profit organizations. We are proud to partner with the Food Bank of Central & Eastern North Carolina on this event. We hope to raise funds as well as collect non-perishable items to benefit local families. The Pub is located at 4711 Hope Valley Rd and open Monday-Friday, 11:00am-2:00am and Saturday-Sunday, 12noon-2:00am. For more information or to get involved contact Kerry Bryant at 919-403-0025 or email kbpaw_21@msn.com.